Taurus and Scorpios are opposites in the zodiac, meaning that this relationship is a case of opposites attracting. Although at first you two may seem to be completely different, many of your inherent values and essences are similar. To begin with, you are both extremely stubborn and extremely passionate. Scorpio and Taurus are both Fixed signs, meaning that once they have made up their mind, no one and nothing can change their decision. If for some reason you two are not on the same page concerning an issue, it can lead to explosive arguments and debates between you both. It is very difficult for either of you to compromise and you both want the last word. Improving your communication techniques and accepting that love should not be a competition or a duel but rather an allied affair may help you overcome this potential challenge of a Scorpio-Taurus relationship. There are many strengths to this union as well. Loyalty comes naturally to both of you. Although both of you take a lot of time to trust someone new, once you have gained each other’s trust you are very devoted to each other, sometimes in a possessive way. Scorpio tends to express their devotion emotionally, through caring for Taurus, paying attention to what makes them happy, pleasing them intimately and spiritually, and being a support system and confidante during Taurus’ most challenging moments. You two are a low-key duo, enjoying each other’s company without the need to be in the limelight. You are both very mature and centered individuals. Taurus expresses their loyalty for Scorpio in a more tangible and practical form. Taurus feels the need to protect and care for Scorpio. Taurus will do everything necessary to provide for Scorpio financially and emotionally. Taurus is a very dedicated worker and they take their responsibilities very seriously, including their relationship with Scorpio. Scorpio feels safe with Taurus, as Taurus is always there when Scorpio’s in need, a true rock for Scorpio to lean on. Both Taurus and Scorpio can become jealous if they think someone else is trying to move in on their lover, or if their lover does not give them enough attention. Scorpio in particular is very territorial when it comes to Taurus, and Scorpio always keeps an eye out for outside intruders. Luckily, both Taurus and Scorpio view jealousy as a healthy sign of loyalty and commitment, so as long as you respect each other it should not get too out of hand. However, Taurus and Scorpios are signs of extremes, so you should still beware of overreacting or making impulsive emotional decisions. Taurus in particular can be very patient for the most part, but when Taurus becomes angry they transform into a completely different person. 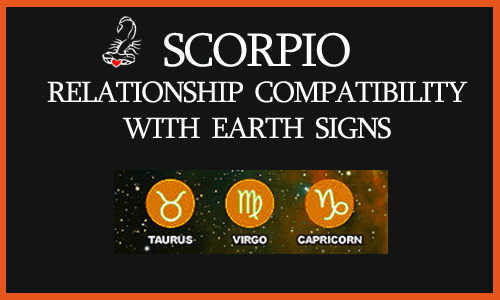 Neither Scorpio nor Taurus are good at finding balance, so that may be a recurring struggle in the relationship. For this Scorpio-Taurus relationship to thrive and be long-lasting, you must both learn how to compromise and tolerate each other’s contrasting personalities. There can be a harmonious effect to your partnership if you put courage and effort into it. Both of you are signs who do not take relationships lightly, and you both thought long and hard before making the decision to commit. For this reason, no matter how hard things may get, neither of you are inclined to quit or give up. You will fight for your love because you know your love is special. Scorpio and Virgo are likely to be on the same page for most aspects of their lives. They will feel eerily connected, as though they were meant to be find each other. Some of their favorite activities will take place in nature, and they will both have a practical touch which can enable them to create meaningful, long-lasting work. Scorpio and Virgo feel most at peace when it is simply them both, isolated from the outside world, on their own intellectual getaway. Both Virgo and Scorpio are extremely guarded and reserved in love. Scorpio demonstrates more depth of emotion, but for this same reason they will test Virgo before opening up to them. Because Scorpio has been deeply hurt in the past, they will do anything possible to avoid further pain. Virgo can relate to Scorpio’s cautious behavior. They too are naturally suspicious, and they can also be insecure in love. Virgo may undervalue their own qualities and believe that Scorpio may find someone better. Virgo benefits from reassurance that Scorpio is as invested as they are. Scorpio and Virgo are likely to have a solid friendship before all else. Because it takes much time for them both to feel each other out and admit their feelings, they may first enjoy a platonic relationship before delving into a more serious one. This actually benefits them greatly in the long-run, because it deepens the bond they both share. When they two are together, and as time goes on, the trust between them is impenetrable. There are few people in the world that they feel this degree of openness with. The potential downfall of a Scorpio-Virgo placement is that these two can be overly dependent on each other. They may bond so closely that they do not feel complete when they are apart. They may also not feel the need to make new friends or invite new people into their lives because they are so comfortable with each other, and even possessive of one another. This can be an unhealthy attachment, but for the most part it is a sign of their true devotion to one another. Nevertheless, Scorpio and Virgo should both should make a conscious effort to have some space in the relationship and to spend some time apart in order to add stimulation to their bond. Virgo and Scorpio are very deep, pensive, introverted, and spiritual beings. They learn a lot from being in each other’s presence, and often they communicate with each other without the need for words. Their intuitive understanding of one another and loyal support is their strongest link. Scorpio is a Water sign and Capricorn is a grounded Earth sign. When these two signs come together in a love match, they complement each other and they are often very compatible with one another. Scorpio is a very suspicious person, but there is something about Capricorn’s energy which allows Scorpio to open up to Capricorn. It is probably the fact that Capricorn emits a very serious, determined and dependable vibe. Capricorn is not the type of person to play games — they are serious business and cannot be easily read. Scorpio finds that to be extremely attractive and intriguing. Capricorn is a very independent person and she has no problem handling things on their own, but Scorpio’s loyalty and reliability are pillars of strength and support for Capricorn. They view Scorpio as someone they can bounce ideas off of who will always respond to them with honesty and integrity. Scorpio tends to follow their intuition and gut-instincts, while Capricorn is more objective and rational when it comes to decision-making. Luckily, both approaches complement each other, and these two work very well in business, just as they do in love. Although it may have taken time for both of their protective defenses to fall down, once Scorpio and Capricorn open up to one another, they feel like they found someone who understands them and respects their vision. Scorpio and Capricorn are two of the most ambitious and determined signs of the zodiac, so when combined they make a nearly unbeatable duo. They both place a high emphasis on their professional career paths, and they support and encourage each other to reach great heights. They are the definition of a power couple. Because Scorpio is more emotional than Capricorn, a potential downfall may be being at odds when it comes to expressing sentiments. For example, when Scorpio is passionate about something, they may be perplexed by the fact that Capricorn does not demonstrate such extreme emotions and has a more aloof and detached aura. With time, Scorpio can learn to appreciate this difference between them, for Capricorn keeps them grounded, centered and balanced. Scorpio can help teach Capricorn to connect to life around them on a deeper, purer, and more emotional level than they are used to — with Scorpio’s help, Capricorn learns to open up their heart. This is a very heavy, serious relationship and it is has many indications of being a very long-lasting and fulfilling partnership as long as neither sign does anything deceptive. Capricorn and Scorpio are signs that will accomplish a lot on their own, but they can create wonders when they direct their energies to a greater purpose. Their combined energy is fierce.